Another positive review – this time from author Cate Gardner (note: I will declare here that Cate is due to have her own chapbook, Nowhere Hall, published this September by Spectral), published on the Skull Salad review site. 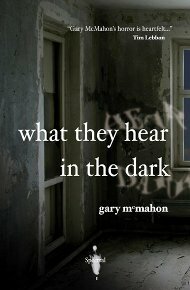 What They Hear in the Dark by Gary McMahon is the first chapbook from new publisher, Spectral Press. Both author and story are excellent choices to open the imprint. There’s no sound in the quiet room. After the death of their son, Rob and Becky move into a new house and discover the room. It’s a room that shouldn’t exist and like grief, the couple experience the space differently. For Becky it is a comforting place, somewhere to feel close to her son. For Rob, it is a different experience altogether. There is a sense of menace to the tale and McMahon weaves these characters and the room into our hearts and our nightmares. What They Hear in the Dark is a gorgeous chapbook–both the story and the presentation. The publisher Simon Marshall Jones has produced a top quality chapbook and I highly recommend it. I should however note (though there is no bias towards the story in this review–I hope) that I have a chapbook forthcoming from Spectral Press.